Horizon Tech is best known for the Arctic sub ohm line of tanks. This was a player in vaping that very quickly became overshadowed by giants in the market such as Kangertech, Sigelei, Smok, and Uwell. One this Horzion Tech has been known for is flavor. The Horizon Tech Falcon is the latest sub ohm tank from long time tank manufacturer Horizon Tech. The Falcon aims to separate itself from other tanks by using different wicking material. Some coils use a combination of wood pulp and cotton, while others use flax paper and/or flax fibre instead. So today, we wll take a look at the Horizon Falcon Sub Ohm Tank. Firstly is about the appearance. The Horizon Falcon tank is a very nice looking tank, it’s not a large tank by any means but feels really well built. I have the green one and it looks great. It’s like a matte lime green and even the o-rings match as well as the resin drip tip. Branding is simple it says “Horizon Tech” on the top cap on one side and “Falcon” on the other. All 6 color options come with a matching resin tip which is nice with the exception of the SS that comes with an orange tip that matches the included orange o-rings. 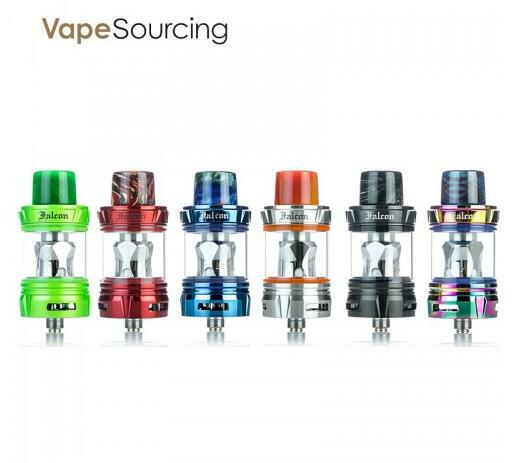 Overall though I find it to be a nice looking tank that follows the same design as many sub ohm tanks. By now, there aren’t too many surprises when disassembling vape tanks, and the Falcon certainly didn’t present anything new or different. But the product is built, designed and machined well throughout – something more companies should strive for in 2018. Secondly is about its performance. When I first noticed the condensation and leaking, it happened while vaping a less-viscous, 60/40 liquid. A slight gurgle tipped me off to some mild leaking through one of the triple airflow slots. Well, the coil was seated as intended. But even after a quick bath and repair, the Falcon still slowly oozed e-liquid from the bottom.Determined to make this work, I tried one more time, giving the tank a bath and switching to a 90/10, max-VG e-liquid. I’ll be damned, the leaking stopped entirely. And the coil once again vaped like an absolute champion during the rest of my testing. Rich flavor, huge clouds, and stutter-free performance on every mod I threw at it. Overall i found this coil to be pretty good as well, but the M1 coil is the one that really shines in this tank. Overall, this one would be my recommendation to pick up. It works well and gives great flavor on the M1 horizon falcon replacement coils. Now, the Horizon Falcon Sub Ohm Tank Resin Edition is a new edition produced by the company, you can buy it also.